Beyond our Boundaries, Episode 21: Resupply - Episode 21 of the Beyond our Boundaries video series - What does a resupply look like? Gossamer Gear Sponsors Beyond our Boundaries - Gossamer Gear supplies backpacks and other gear for our family's AT thru-hike. Beyond our Boundaries, Episode 8: First Crossing - Episode 8 of the Beyond our Boundaries video series - our first state is done! Beyond our Boundaries, Episode 6: Trail Beginnings - Episode 6 of the Beyond our Boundaries video series - on the trail at last! 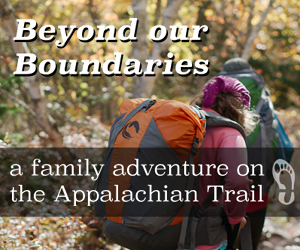 Sawyer Sponsors Beyond our Boundaries - For our Appalachian adventure Sawyer is helping to keep our family safe by providing us with insect protection and water filtration. Family Thru-Hike Gear List - What are we packing for our hike? That is the big question. Foot-Powered Adventure Books Giveaway - A giveaway of backpacking trail stories. GoLite Sponsors Beyond our Boundaries - Packs, sleeping bags and rain jackets - we are pleased to announce that GoLite will be helping us out with some gear for our upcoming trip! SteriPEN Sponsors Beyond our Boundaries - For our Appalachian Trail adventure SteriPEN is supplying our family with water purifiers. Minimalist Footwear for Backpackers - Part 2 - What do we think the is optimum footwear for backpacking? You may (or may not!) be surprised. Minimalist Footwear for Backpackers - Part 1 - Are burly boots required for backpacking? We don't think so. An Interview with Barefoot Jake - Ultralight/Minimalist Backpacker - Barefoot Jake stops by to chat a little about backpacking in minimalist shoes. Hiking Mount Katahdin - A brief video of hiking Mout Katahdin. Expedition Trekking in Minimalist Footwear - A course on expedition planning through the Backpacking Light Wilderness Trekking School. An Interview with WalkAbout - A Barefoot Thru-Hiker - When your footwear really counts, sometimes no footwear is better. Can't Find Minimalist Shoes that Fit? Make Your Own! - Sometimes the best option for footwear (not to mention the most rewarding) is to just make your own. Hiking in Huaraches - I have gone barefoot for many years as I prefer my feet to be open to the air. Until a short while ago I wore open sandals when it was impractical to go barefoot.